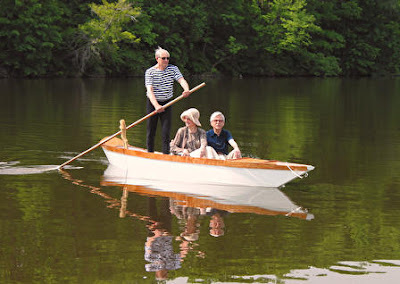 Bruce Miller in Lansing, Michigan, after visiting Venice, decided to build himself a boat. That boat was launched in May of 2002. I've been communicating back and forth with Bruce since then, and I can honestly say that he did an exceptional job. We spoke on the phone many months back. I told you about the S'ciopon I was building. I finished it in May and launched it at a party for 50 friends who had been hearing about my plan to build a Venetian boat for years. It took about 600 hours to build. Bruce launches his special boat each spring. This year's launch took place on May 1st. 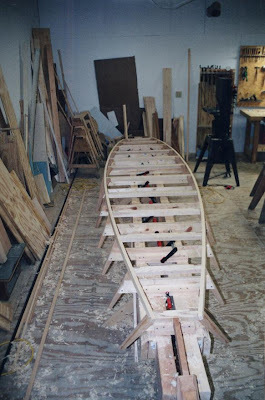 Bruce Miller sent me a detailed description of how he decided to build his own Venetian boat. I have always been a boat lover, so on my first visit to Venice I fell in love with Venetian rowing boats. I watched with fascination as the gondoliers gracefully rowed tourists on the Grand Canal. What an amazing way to move a boat; I knew then that I would have to build one to add to my collection of two sliding seat single shells. On the second trip to Venice I was walking on the Lido, the barrier island that separates the lagoon from the Adriatic, and, attracted by a sign on a gate, wandered into the boathouse of Circolo Canottieri Diadora – the Diadora Boat Club. I did horribly; unhappily it was my last day in Venice so I had no further chance to improve. Since then I have spent three to four weeks in Venice every summer for the past five years. I am now a fairly proficient rower, thought I have not mastered rowing valesana—rowing from the stern with two crossed oars. Diadora is the most welcoming club in Venice. Lino and the other members of the Club are very friendly to anyone who wants to learn to row. I have rowed with Japanese, Australians, Austrians, and Americans along with Italians from Venice, Rome, Naples and other Italian cities. One year I was invited to row in a caorlina, a boat with six oars, in La Sensa, a festival celebrating the marriage of Venice and the sea. On Saturdays it is customary for all who show up in the morning to launch as many boats as needed and to row across the lagoon to the Rialto where the rowers shop in the fish and vegetable stalls and then take refreshment at one of the many bars before returning to the Lido. Last year a group of rowers and passengers took an eight-oared boat, the gondoleone, across the lagoon to a famous restaurant on the island of San Erasmo. It is about two hours each way, and of course the meal was a two-hour festivity. If you are going to Venice and wish to row, you can do no better than rowing at Diadora. Two years ago I retired and had the time to build a Venetian boat. The Sandolo da S’ciopo (or S’ciopon) is a traditional boat used by hunters and fishermen in the lagoon. 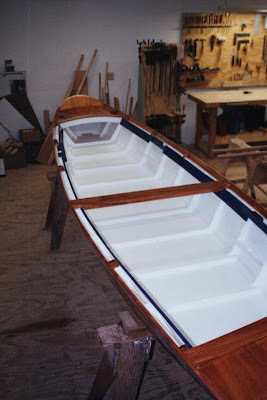 I chose to build one because it is the shortest Venetian boat, at 19 feet and 3 inches, and would fit easily in my shop. 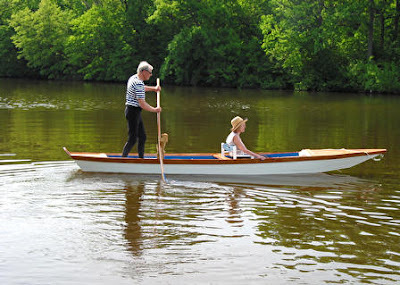 It is also easily rowed by one person, with one oar or valesana. The traditional method of boat building in Venice is right side up; gondolas are still built that way, but most other boats are built up side down. The construction process is not different from building any other type of boat with frames and planking or plywood sides. Since a S’ciopon was a working boat it was finished rather plain. But this was my boat so I added a couple of elegant touches - the bow deck is angled and the stern deck is cambered. I used mahogany, varnished, for these and for the outwhale. This is often seen on other types of sandolas, but not on a S’ciopon. 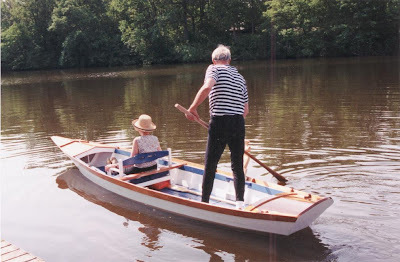 I ordered two forcolas from Saverio Pastor, a craftsman who makes forcolas and oars; I did not believe I could make suitable forcolas myself; they are a complex shape and must be done in the right proportions to fit the boat and the rower. However, I am now making forcolas in my shop, at present simply for sculptures that show the beauty of these functional objects. I did venture to make oars. I have a few books that provide dimensions and I had taken measurements of oars at the Diadora. It was a challenging task, but they work well as far as I can tell. A traditional S’ciopon did not have a seat for passengers. I wanted to give my friends a ride, so I built a removable bench for two passengers. I named the boat “Maureen” after my wife who introduced me to Venice. Many compliments to Bruce Miller. His sc'iopòn is great. Keep up the good work, Bruce. Bruce, that's a great story and result! To other readers, I contacted several Americans in Venice to learn the proportions of the forcole and Bruce sent me photos and drawings and I am sooo appreciative of his sharing his experience. More as soon as I make headway! !